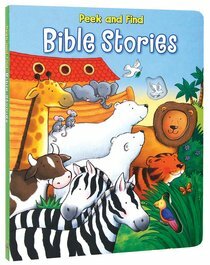 Who could resist looking for all the surprises hidden in this board book?imple text and colourful artwork bring the creation, Noah's Ark, the baby inhe bullrushes, and more to life, while special prompts draw young readers ins they look for hiddden animals peeking in through die-cut holes. About "Peek and Find Bible Stories"
Allia Zobel-Nolan is an internationally published, award-winning freelance author specializing in children's books and adult humorous books. She has written over 150 titles, and has over 2.5 million books in print. Her work has appeared in The New York Times, The Washington Post, New Woman magazine, and dozens of other newspapers and magazines. She lives in Connecticut with her husband, Desmond, and their three cats.